The chapter is an attempt to analyze the Polish problem and its influence on the development of Soviet-American and Russian-Ukrainian relations. The Polish problem consists of two parts: firstly, the question of territorial claims of the Soviet power concerning Western Ukraine and Western Belarus (the territory of Poland till 1939); secondly, the return of the Polish government-in-exile to Warsaw and its recognition as the only legitimate government. The chapter examines the evolution of the US position, which was caused by the logic of development, and not by the change of the state leader, as it is commonly believed. The presence of the Soviet army on the territory of Poland has created objective difficulties in the return of the Polish territories and the comeback of the Polish government from emigration. Despite pressure from the multi-million Polish diaspora, American presidents could not resist the will of the Soviet Union and were forced to abandon further disputes. The history that became a reality in 2014 in Ukraine led to an unprecedented war of memories. By the Polish problem the question of territorial claims of the Soviet power concerning Western Ukraine and Western Belarus is understood. The situation becomes more complicated, since the above mentioned territories belonged to Poland till 1939; and these claims matched up with the return of the Polish government-in-exile to Warsaw and its recognition as the only legitimate government. The Polish issue has been studied by Russian scholars mostly through the prism of personal leadership opposition of Churchill and Stalin (Vasilenko, 2005; Chernyshev, 2006); however, the relations between the USA and the USSR regarding the Polish issue have not been given due attention. At the same time, the research of the Polish question in the context of Soviet-American relations has been done through the incorporation of Poland into the common narrative of Eastern Europe. It is worth highlighting the important studies of Pechatnov (Pechatnov, 1997; Pechatnov, 2006), and Manykin (Manykin, 2018), who analyzed the attitude of the American political elite to the formation of new governments in Eastern European countries after the end of the World War II. General principles of post-war planning were identified, bringing together interests of the USA and the USSR in the foreign policy in 1942-1943. A promising conjecture linked victories of the Red Army on the Eastern Front with emergence of geopolitical contradictions. A complete picture of the position of the Harry Truman’ administration concerning the Polish question has been drawn by Vasilenko (Vasilenko, 2015) by emphasizing the Polish question through a common Eastern European and Soviet narrative. The initiator of the rigid line against the USSR because of the Polish question was not believed Harry Truman, but his advisers. Polonists also deal with the problem of post-war Poland (Poland, 2012) forming an understanding the connection between the internal political instability in Poland and the foreign policy debate of the United States and the Soviet Union during the Yalta and Potsdam Conference. Provisional Government of National Unity: Polish government (1945-1947) formed as a coalition between the Polish Workers' Party and Stanislaw Mikolajczyk, former Prime Minister of the Polish government-in-exile. Georgian Ribbon: Black and orange ribbon, the main Russian national symbol of the Great Patriotic War. Polish Problem: The question of territorial claims of the Soviet power concerning Western Ukraine and Western Belarus (the territory of Poland till 1939); and the return of the Polish government-in-exile to Warsaw and its recognition as the only legitimate government. War of Memories: One of the forms of ideological war that has been fought in the post-Soviet space since 1991. 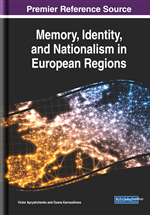 In Ukraine, Georgia and the Baltic countries, the “war of memories” took on forms of de-Sovietization and the revival of national history. Donbass: The historical, cultural, and economic region in eastern Ukraine and southwestern Russia. In the article, the Donbass refers to the territory of eastern Ukraine, in which Donetsk and Luhansk people's republics were formed in 2014. Communist Memory: Recognition of the Soviet past, which has positive connotations for the population, the rejection of nationalism as an ideology and nationalist rhetoric, the exaltation of Soviet history and the victory over fascism. The reflection of the “communist memory” in Ukraine is wearing the Georgian ribbon, laying flowers at the memorials of fallen Soviet soldiers, guarding the monuments of Soviet commanders. Nationalist Memory: The opposition of the “communist memory,” the search for and the exaltation of national heroes who fought with the Soviet authorities, the chewing of soldiers and divisions who fought on the side of Nazi Germany.